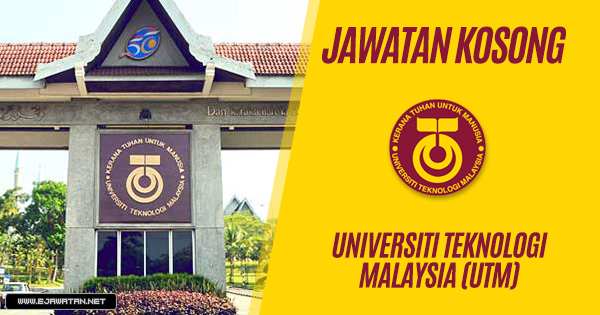 Universiti Teknologi Malaysia (also known as UTM) is a public research University in Malaysia and a research-intensive university in engineering, science and technology . It is located in Kuala Lumpur, the capital city of Malaysia and in Johor Bahru, the southern city in Iskandar Malaysia. UTM is a graduate-focused university with 56% of its student population consisting of postgraduate students, the highest in Malaysia. As of 2015, UTM has more than 5,000 international students from more than 60 countries, the highest among research universities in Malaysia. Untuk mengetahui lebih lanjut mengenai info jawatan kosong terbaru yang ditawarkan oleh Universiti Teknologi Malaysia (UTM) ini dan permohonan online, sila klik pautan yang dipaparkan di bawah.